Free popcorn at the Aquarium! There's a tasty reason to come to the Aquarium's IMAX Theatre to bask in the glow of a super-sized nature film during the upcoming school vacation. Get a coupon for free popcorn at the Simons IMAX Theatre when you buy IMAX/Aquarium admission combo tickets! This special offer is valid during the school vacation week from Saturday, Feb. 18, through Sunday, Feb. 26. 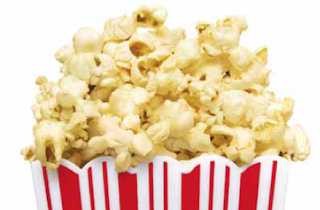 Buy an Aquarium/IMAX combo ticket at the box office or online and receive a voucher for a free popcorn ($3 value). For tickets purchased online, bring a copy of your receipt to the box office to receive your voucher. Redeem popcorn vouchers at the IMAX Theatre. This offer is valid only for combo tickets purchased February 18 through 26. Let our IMAX films transport your family to another world—from tropical shallows to the mysterious deep sea to the dusty savannah. You'll definitely want snacks for the ride! Aquarium Renovation is Front Page News! A New Class for Toddlers!